Seven sensational seafood barbecue recipes are featured in this issue of Seafood Recipe News. Seafood and barbecues go together. Shrimp, salmon, scallops, trout and more. Use the recipes here to develop your own. Fish, as a general rule, needs 10 minutes cooking time per inch thickness - keep turning it over so that it cooks evenly. If you can, cook seafood on the outer edges of the coals. All the marinades and herbs will go with just about any fish or seafood. 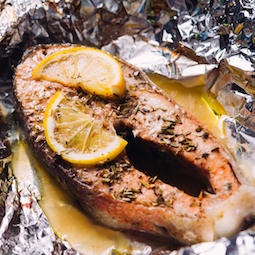 Cooking fish in foil keeps it moist - cooking fish directly over the grill makes it crispy. Oil the grill and oil the fish. Really great sides are salads and minted new potatoes. Crusty bread is *very* easy as a side. Garlic bread is really simple - slice the stick, butter with garlic butter, wrap in foil and place on the barbecue for 10 minutes or so - gorgeous! A simple barbecue sauce recipe, one that you will go to over and over. 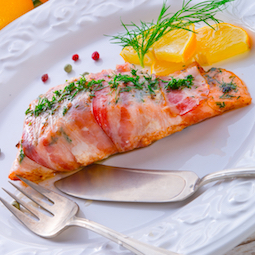 Salmon wrapped in prosciutto - very simple to put together, just needing some thinly sliced onion and seasoning. You can cook this either on the barbecue, in the oven or broil it. Top it off with some herb butter and serve with salad vegetables and new potatoes. Shrimp take about two or three minutes a side to cook on the barbecue. See the general rule about '10 minutes per inch thickness'. You can tell when they're done as they'll be pink all the way through. Serve as part of a mixed barbecue - thread some cubed vegetables onto the skewers, maybe zucchini, onion, bell pepper to make the shrimp go further. 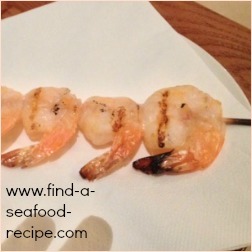 They benefit from a marinade and there are loads of suggestions with this recipe - click on the photo or here to read more about marinated grilled shrimp. Barbecued salmon again - I make no apologies for that. It is one of the best fish for barbecuing or grilling. It's so meaty and succulent. There are two methods of barbecuing salmon here - one marinaded and cooked in foil and the other, more plainly cooked. You can add any herbs you like to the marinade, but favourite ones for fish are dill, parsley, chives and tarragon - read more about herbs to go with seafood. 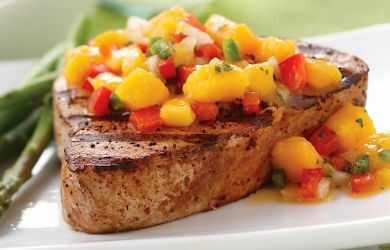 Tuna steaks marinaded and served with a spicy salsa. Just the thing for a quick meal. Prepare the salsa, maybe cook some salad potatoes and perhaps grill some asparagus for the last two minutes and you've got a meal fit for visiting dignitaries. 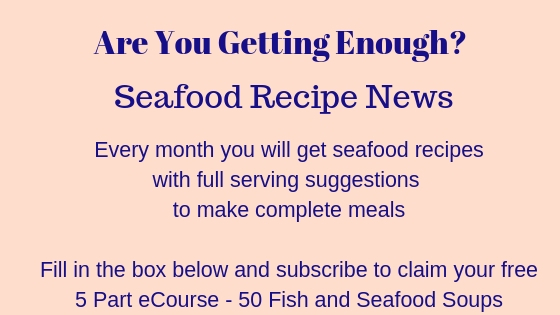 Any firm fish steak would do for this recipe - halibut, sword fish, marlin, salmon - anything you've got - if you've caught it yourself, what a treat this would be. This is amazing - the BBQ Pit Boys are just fabulous - real fancy toothpicks! your women will feel unwanted. The recipe calls for the sauce: two sticks of butter, 4 cloves minced garlic and zest of one lemon. The smoky rub: 4 tablespoons paprika, 6 tablespoons brown sugar and 1 tablespoon of dried basil. You'll be able to tell the scallops are ready when they're firm to the touch - around 20 minutes or less on a grate just off the coals. Weber make fabulous barbecues (I've had one since 1985 or so and it's still used!) and they also have a blog with recipes galore. This one is for a whole barbecued trout - the main tip is about oiling. When you cook meat or vegetables, the fibres are so much denser - fish and seafood is more tender. SO - oil the grate and the fish - if you're doing meat or veg, not so important, but with fish, you need to oil and oil to prevent the tender fibres sticking and the fish breaking up before you've served it. 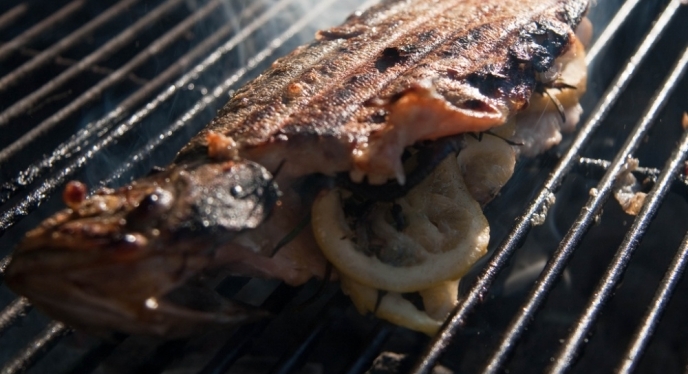 This recipe for Barbecued Whole Trout is super easy to prepare and cook. The BBQ Pit Boys again with a surf and turf - and what a feast. They say don't whine about the cost - you'd spend more on a meal out and you don't have to tip the waitress!! So, we have: king crab, mussels, clams, scallops, shrimp, steak and sausage - roasted garlic, bell pepper, onion and mushroom. You don't have to use all those things of course, but you'll see *how* to cook them.